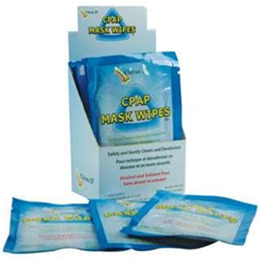 The Citrus II® CPAP Mask Cleaning Wipes use a natural formula to gently clean all types of CPAP and BiPAP masks such as nasal pillows, full face, nasal masks or total face sleep apnea therapy masks. Use the Citrus II CPAP Mask Cleaning Wipes for oxygen therapy supplies as well, such as nasal cannulas, oxygen masks and accessories. The Citrus II CPAP Mask Cleaning Wipes Travel Pack include 12 individually wrapped wipes perfect for those on traveling.